A section of the “Finds Gone Astray” exhibition at the Bible Lands Museum in Jerusalem, January 3, 2019. Photo credit: Bible Lands Museum. The exhibit ‘Finds Gone Astray’ in Jerusalem constitutes a violation of international law, yet frames Israel as a preserver of history. Indeed, while “Finds Gone Astray” laments looters in the West Bank, it makes no mention of the violations of international law inherent in the exhibit. Geneva, Hague and UNESCO Conventions prohibit Israel as an occupying power from assuming ownership of West Bank antiquities or transferring such artifacts out of the territory. To date, according to Emek Shaveh, the Civil Administration has seized 40,000 allegedly looted artifacts from the West Bank since Israel occupied the area in 1967. 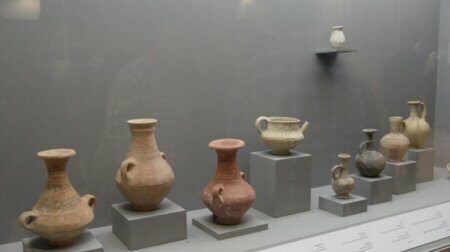 Israel is one of the few countries to permit trade in antiquities. “By permitting trade in antiquities, Israel creates a market for antiquities robbers,” adds Emek Shaveh.